A sensitivity link connects sensitivity variables that vary similarly to reduce the number of optimizations HOMER runs. You can specify multiple values for a sensitivity variable. HOMER performs a separate optimization procedure for each possible combination of sensitivity variable values. The total number of sensitivity cases is the product of the number of values specified for each sensitivity variable. With several sensitivity variables, each with several values, the number of sensitivity cases can be very large, resulting in a long computation time. Because some sensitivity variables tend to vary together, it can can be beneficial to link them for the sensitivity analysis to greatly reduce the number of optimizations HOMER runs. When you link two sensitivity variables, HOMER optimizes the system with each pair of values. You must specify the same quantity of values for all variables in a sensitivity link. 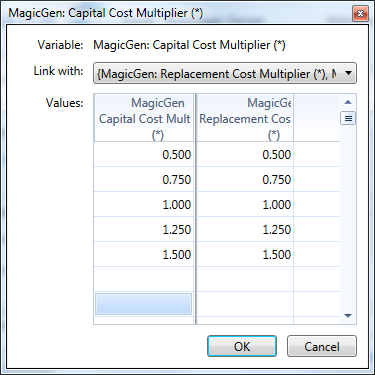 Capital cost and replacement cost are good candidates for a sensitivity link. If the capital cost is higher than expected, it is likely that the replacement cost is also higher. You can specify a sensitivity link from the sensitivity variable editor. Click on the sensitivity button ( ) to open the sensitivity variable editor. Enter values for the sensitivity variable. Click OK. Open the editor for any other sensitivity variable, and select a variable from the Link with: drop-down menu shown below. After you select the variable with which to link, HOMER creates a "link group" for these sensitivity variables. HOMER displays a warning until the member variables of the link group all have the same number of entries. 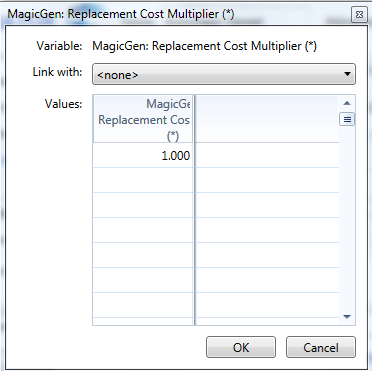 You can add another variable by opening its sensitivity variable editor and selecting the desired link group from the drop-down menu. You can create many link groups, and link any number of variables together in each group. In the example above, HOMER optimizes with pairs from each row in the table; for example (0.5, 0.5), (0.75, 0.75), and (1.0, 1.0). In this example, HOMER runs five optimizations for the five sensitivity cases. Without the sensitivity link here, HOMER runs 25 optimizations instead of five; for example, (0.5, 0.5), (0.5, 0.75), and (0.5, 1.0).